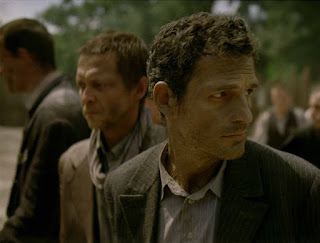 Son of Saul is a pure illustration of horridness that is justified. It is not a horror film in that it is not trying to be sickening just for the sake of it. The film reaches and shakes us as an audience with its take on the pitch black reality of those persecuted under Hitler. The story follows a man, Saul, who comes across the dead body of his child while working at the gas chambers. He then goes in a death-risking search for a Rabbi in order to have a proper burial of his son. I had no idea what to expect when the camera opens being stuck to Saul’s face. One can hear the whipping of somebody while we see Saul’s emotionless eyes. We slowly realize that the setting is a gas chamber and we have been thrown into the hell of decades ago. One hears the cries and sees the children in this plot being completely ignored of their innocence while they die painfully. The camera goes away from Saul at one point and catches a woman, who’s naked, sobbing because she realizes what is going to happen to her. I don’t think we realize how gruesome and satanic this situation was. The film bashes our skull with its reenactment. Saul has no choice but to continue working in the gas chamber unless he wants to end his life. We see a stone face while his fellow Jews are hollering, screaming, and crying while they are suffocating. László Nemes captures the desperate condition of inaction that all of these men are dealing with every death-inducing day. A Nazi at one time suffocates a survived boy with a macho-like no mercy attitude. The scene is angering and horrific. The film raises the concentration of a hatred for racial-hate groups in me. The Nazis rise to a caliber that justifies the fiction somewhat of Inglorious Basterds. You feel a rush of suspense and fear when Saul checks for the passports of the recently murdered to confirm if his child had died. We think of a likely probability that he will get caught and killed. The all-around degrading act of having someone condone the massacre of his own people is baffling to me. Saul is made to scrub up the blood of the victims of heinous crimes while being surrounded by those same crimes being carried out. This piece of history was a purely thought film that had to startle to be accurate.